Yesterday, Checkpoint published a detailed vulnerability report about a serious vulnerability in WinRAR (reportedly used by 500+ million users) which allowed a malicious archive, when extracted, to create an arbitrary file in a chosen location on user's computer. This includes,for instance, user's Startup folder where said file would get executed when the user logged in to Windows again. the flow of his analysis, including the problems he stumbled into, and tools he used to analyze the vulnerability. Anyone interested in analyzing vulnerabilities, or in details of this particular one, is advised to read his report. 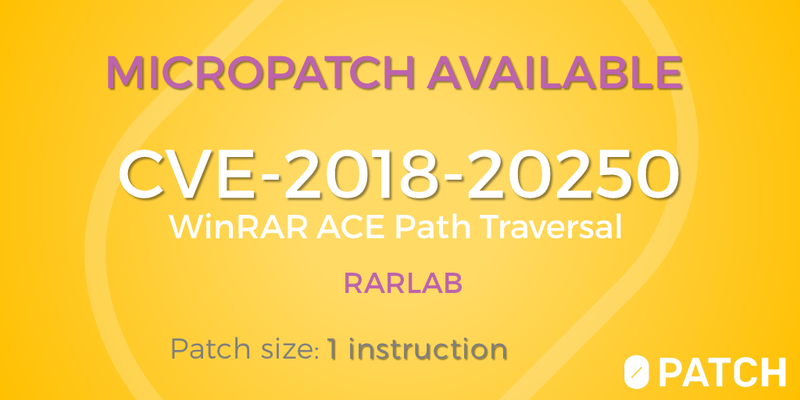 The vulnerability (CVE-2018-20250) was present in WinRAR's extracting of ACE archives, whereby said extracting was actually done using a dynamic library UNACEV2.DLL written by e-merge GmbH, maintainer of WinACE software. This DLL, interestingly, hasn't changed since 2005 - which actually attracted Nadav's attention. To Micropatch Or Not To Micropatch? For us at 0patch, a vulnerability like this is inherently interesting: it allows for a remote code execution, it potentially affects millions of users, and the product doesn't auto-update so it is likely to be present for a long time. And while we've micropatched a bunch of 0days lately, 0patch is primarily meant to bridge the security update gap by fixing vulnerabilities that may already have an official fix. This vulnerability is a perfect candidate for malicious phishing campaigns. "Please review the attached purchase order PO.rar." WinRAR is a really widely used product. Maybe it doesn't actually have 500 million users but still. No auto-update means that most users will never update it. In fact, unless one has actually read about this vulnerability (surely most users haven't) and feels threatened by it, why would one take the time to update? Some users may actually need the ACE format support. Granted, there is still WinACE, but in contrast to WinRAR, its maintainer seems long gone. From defensive perspective, blocking exploits of this vulnerability is not as simple as rejecting files with .ace extension, as a malicious file can also be renamed to .rar or .zip (or likely any other supported extension) as long as it's extracted with WinRAR. The user can't even tell that a ZIP file is actually an ACE file. Admins with multiple 0patch Agents on users' computers would like the fact that whichever version of WinRAR, even if old and vulnerable, their users use or "temporarily" install, they will be protected against this issue. Other products than WinRAR may be using this particular version of UNACEV2.DLL, and our micropatch would protected from a similar attack too, without us even knowing what these products are. As you suspected, we decided to go ahead. Fortunately, Nadav's analysis provided most of the details we needed (big thanks, Nadav!) and a potential solution was fairly obvious. If you look at Figure 15 in his report and the accompanying text, you'll see that the exploit causes the execution through a branch that allows the malicious file path to remain a relative path by prepending it with... well, an empty string. So the idea was to always force the execution through the other branch, which prepends the malicious path with the target directory. These are both invalid paths and an application can't create a file using them. When the micropatch is applied, extracting a malicious ACE archive results in a number of warnings as shows below, and files aren't extracted. By micropatching this vulnerability in a 14-year old closed-source DLL we demonstrated how suitable in-memory micropatching is for quickly fixing a critical vulnerability, even when fixing it in source code is literally impossible. One nice side-effect of micropatching a third-party DLL is that while our micropatch was targeted at WinRAR, it actually protects all products using this particular version of UNACEV2.DLL from a similar attack. The DLL will be patched no matter who loads it. If you come across one, do let us know! As always, if you have our Agent installed and registered, this micropatch is already on your computer - and applied to WinRAR whenever it loads UNACEV2.DLL (enable popups via 0patch Console to see when that happens). Otherwise, you can register a free 0patch account and install 0patch Agent to get this micropatch applied to your WinRAR. Nevertheless - if you don't need support for ACE format in WinRAR, we recommend you update WinRAR to a fixed version (currently 5.70 beta 1). There may be other vulnerabilities there in UNACEV2.DLL which are more likely to be found now that it's been put in the spotlight. This vulnerability, similar to CVE-2018-4993, the so-called Bad-PDF reported by CheckPoint in April last year, allows a remote attacker to steal user's NTLM hash included in the SMB request. It also allows a document to "phone home", i.e., to let the sender know that the user has viewed the document. Obviously, neither of these is desirable. At the time of this writing, the latest version of Adobe Reader DC, 2019.010.20069, is affected but older versions are likely in the same boat too. To understand the problem, let's start with the above-mentioned Bad-PDF (CVE-2018-4993). The malicious PDF included a certain element that triggered automatic loading of another PDF from a remote share. Until Adobe Reader got patched, this happened without the user noticing anything, or being able to prevent it. Security warning added to fix the Bad-PDF issue. This warning allowed the user to decide whether to allow the potentially malicious document to "phone home" or not. Attempting to load a remote style sheet via HTTP triggers a warning. The Reader already implies the correct behavior by showing a security warning on loading a remote style sheet via HTTP, so we decided to add our own security warning for loading style sheets via UNC as well. Both HTTP- and UNC-based style sheet loads reach the above code block, whereby an HTTP-based load never returns from the first call marked in red (it triggers an exception that Reader handles somewhere else), and a UNC load is implemented inside the second call marked in red. As you can see from the comments in the code, we found where the file path resides before the second call (this required a little digging on the stack at that point). We verified it by changing said path on-the-fly in debugger to make sure the path-loading code actually uses that, and then we were ready to inject our patch. There exists a handy Windows function called PathIsUNCA, which is already being used by Reader elsewhere to check whether a path is a UNC path (the "A" at the end denotes an ASCII path in contrast to a wide-char path). 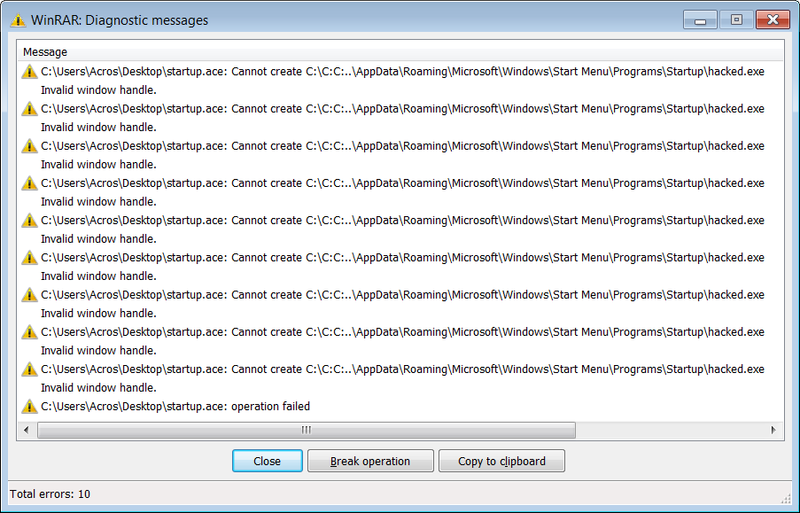 So we decided to first call this function to see if we have a UNC path, and then if we do, issue a prompt to the user. To do the latter, we used another well-known Windows function MessageBoxA. Based on user's response, we would then allow the UNC path to be loaded or not. The only thing to decide at this point was how to implement the "not", i.e., how to prevent the UNC path from loading if the user decided not to trust the document. In such cases, we always want to keep things simple and minimize possible surprises. We therefore decided to simply empty the path string by putting a zero at its beginning, resulting in Reader trying to load an empty path. It does complain that it can't load it though but the exploit is blocked and, frankly, we're fairly confident that loading style sheets form UNC paths doesn't work at all because as much as we tried, Reader always encountered an error. So maybe UNC style sheets are not a supported use case at all but they did turn out to be a vulnerability. call PIT_PathIsUNCA ; is it a UNC path? cmp eax, 6 ; Did user click "Yes"? 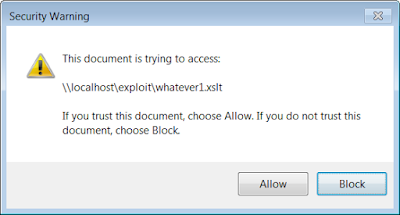 The security dialog that was micropatched into Adobe Reader. If the user selects "Yes", the remote style sheet is loaded (whereby the SMB request delivers your NTLM hash to the remote server), and if they select "No", Reader complains about not being able to load the style sheet from and empty path. Done. As always, if you have our Agent installed and registered, this micropatch is already on your computer - and applied to Adobe Reader whenever it loads AcroForm.api (that only happens when certain documents are opened). Otherwise, you can register a free 0patch account and install 0patch Agent to get this micropatch applied to your Reader.